There is a hidden nest on this frond. The frond leans over a bench in a garden. You could sit right below this hummingbird nest and not know it was there. We would not have seen this hidden nest on our own. I was told about it. There had been two chicks. They had left the nest. Since we were too late to see the chicks, we looked at the nest for clues. All of the droppings on the leaf are a good sign. The hummingbird babies would have to have grown big to make that much waste. The nest is also flattened out, which happens as the babies get big. 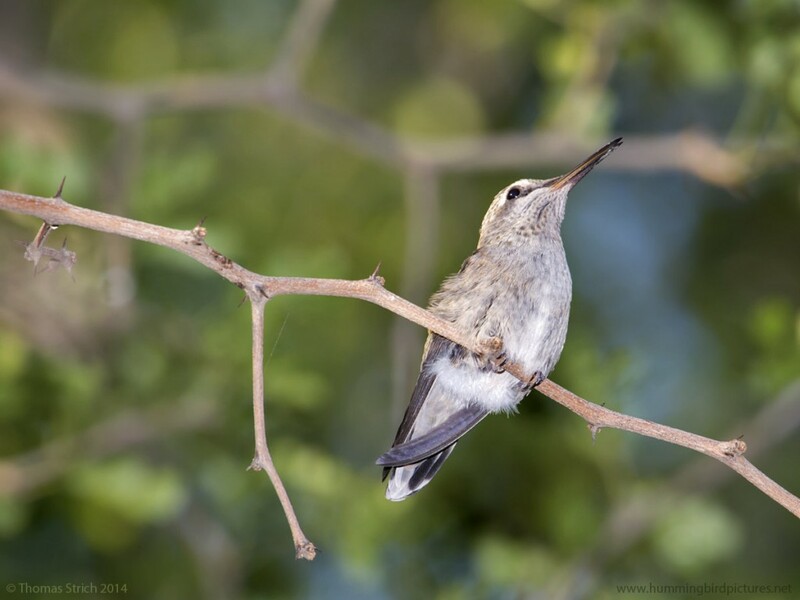 Hummingbird chicks that have recently left the nest call out to their mother to be fed (a high-pitched “peep!). We did see an immature hummingbird nearby but did not hear any peeping or see any begging. We concluded that this was likely an Allen’s Hummingbird nest. 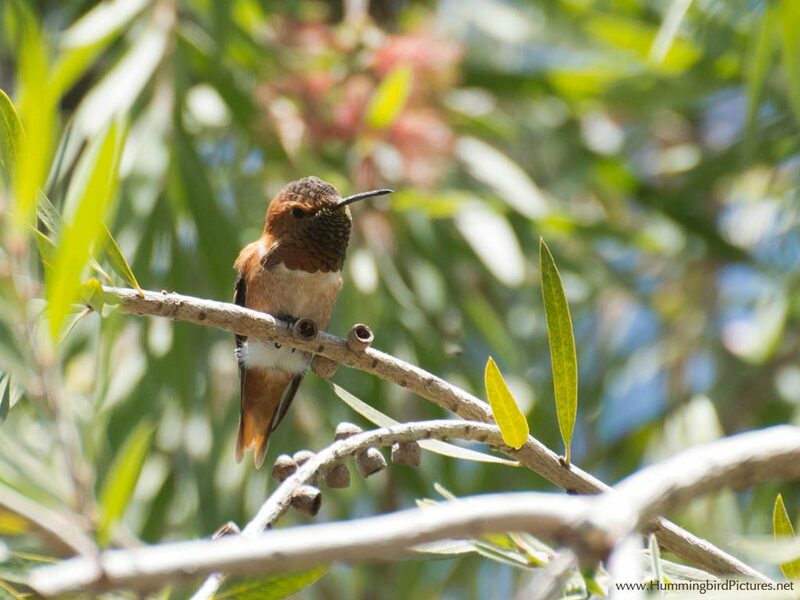 We based that conclusion on the many Allen’s Hummingbirds in this coastal Southern California garden. And the nest seemed a little smaller than the Anna’s Hummingbird nests we are used to seeing. 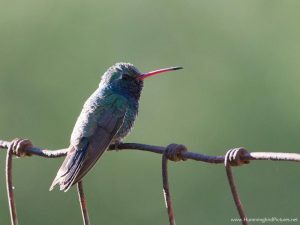 The garden was busy – with visitors and with many Allen’s Hummingbirds. The hummingbirds were chasing each other during the middle of the day. If you followed their buzzy, chattering calls, you could find them, high in the trees. 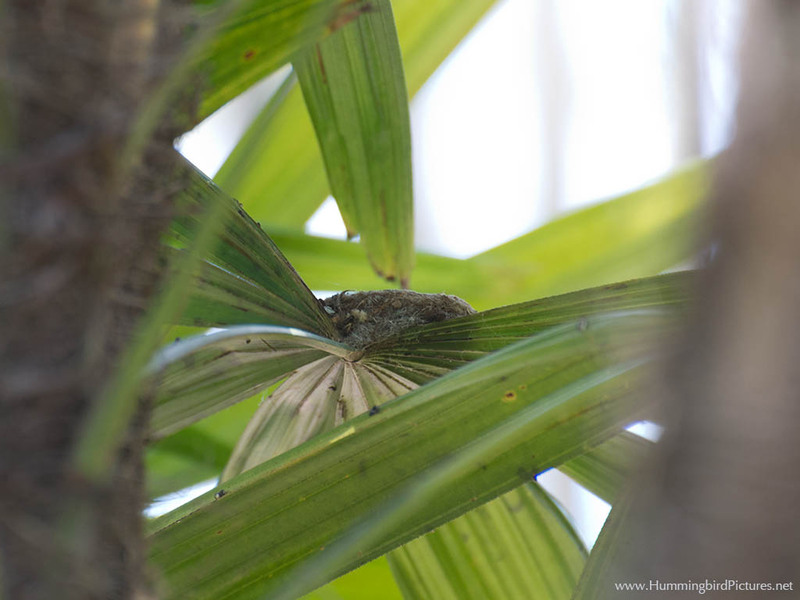 How small is a hummingbird nest? 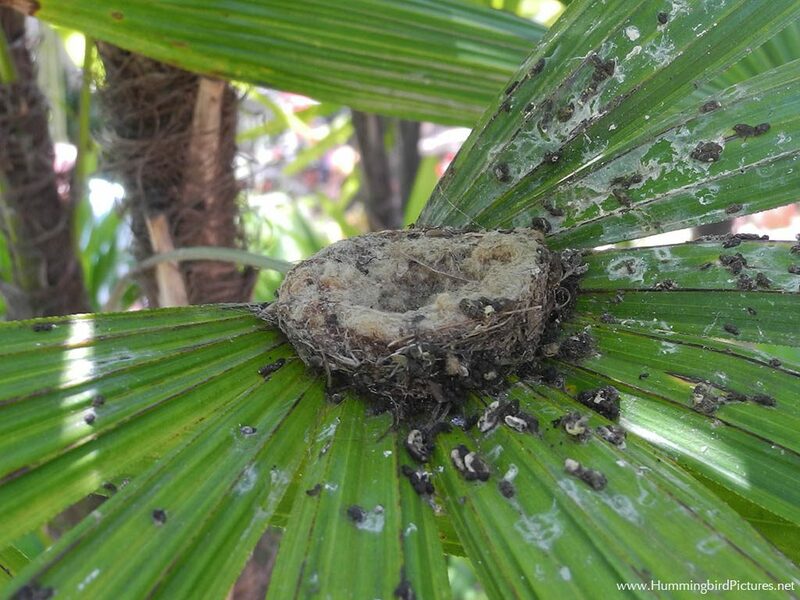 Compared to things we handle everyday, just how small is a hummingbird nest? 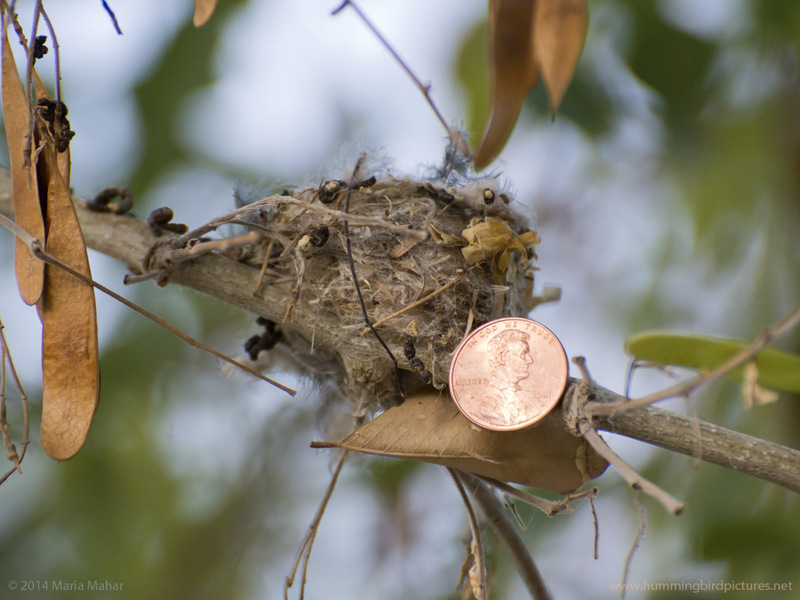 It is hard to tell, so I took photos of an empty hummingbird nest with small coins next to it for size comparison. 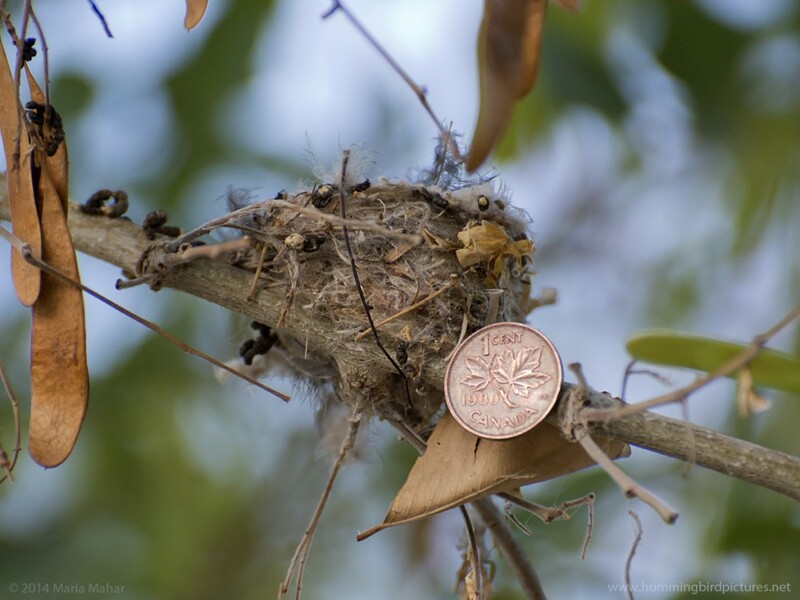 Take a look at these pictures of one Anna’s Hummingbird nest, first with the baby in it, then later next to pennies (or cents) from the U.S., Canada, Great Britian and Europe. It was late in the season and getting hot by the time this baby hummingbird fledged. The mother hummingbird would not reuse the nest this year. The nest was in a low tree branch, about 6 to 7 feet (2 meters) off the ground. After the nest had been empty for about a week, I came back with step ladder, coins, and double-stick tape. Here is a U.S. penny next to the nest. The nest has dried and shrunken a little bit since it has been empty. 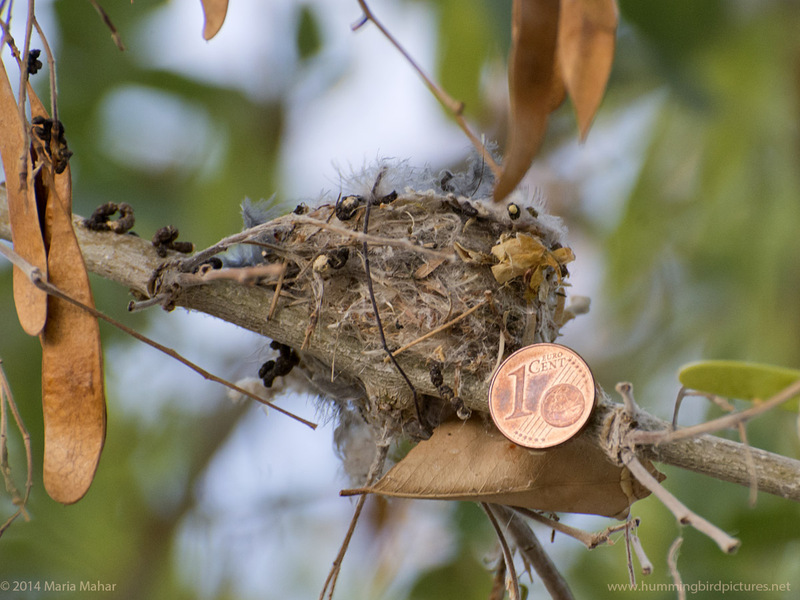 But the penny’s size still shows how tiny the hummingbird nest is. 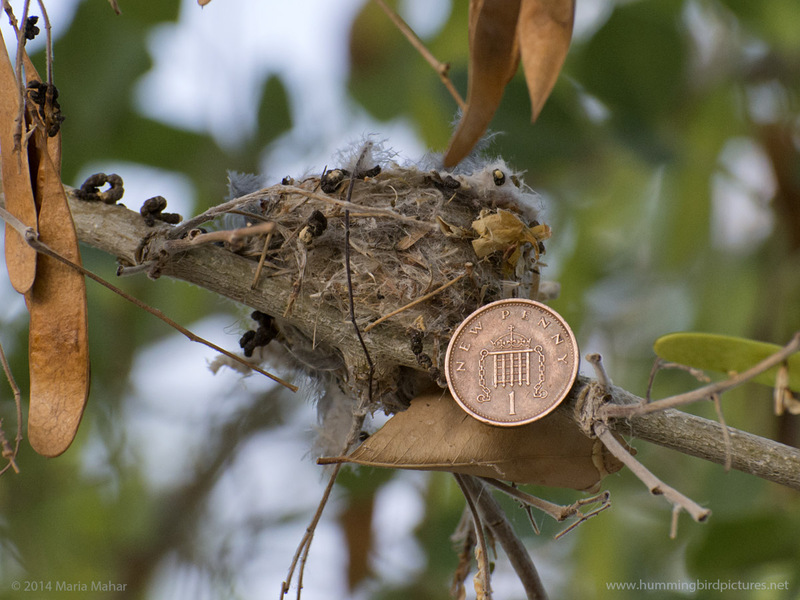 Here is the hummingbird nest compared to a Canadian penny. Anna’s Hummingbirds nest along the West coast of Canada. Here it is compared to a British penny. 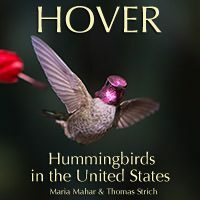 This is for our British viewers – sorry no hummingbirds outside of the Americas. And a Euro cent coin. This is for our viewers across Europe. Again, no hummingbirds in Europe. 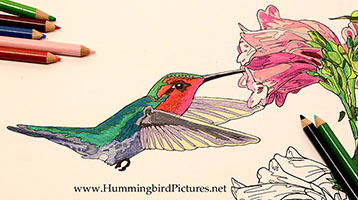 Hummingbirds are only found in the Americas (with the majority in South and Central America). 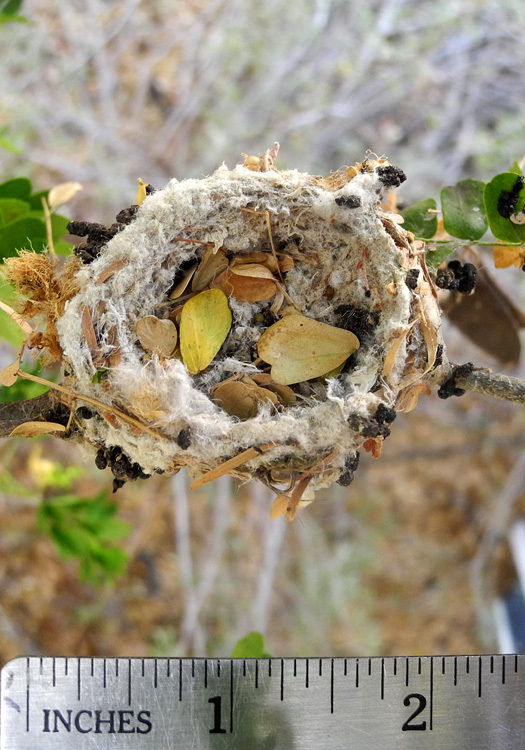 Here is a picture from above of another empty, well-used Anna’s Hummingbird nest. 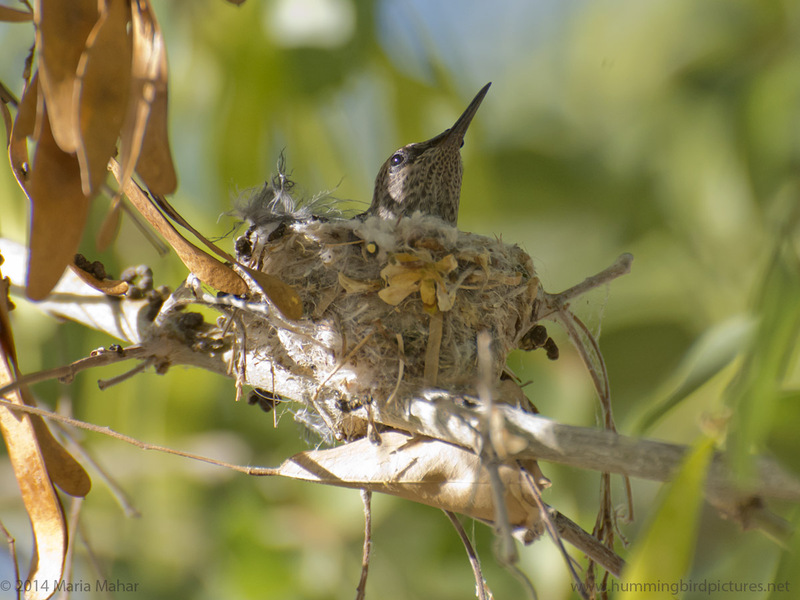 See the post on a different Anna’s Hummingbird nest over time for more photos of this nest. The nest measured less than 2 inches (~ 5 cm). Go here to see this nest with the tiny eggs in it. Thanks for coming by. Check out some of our other picture posts, nesting posts, or return home. 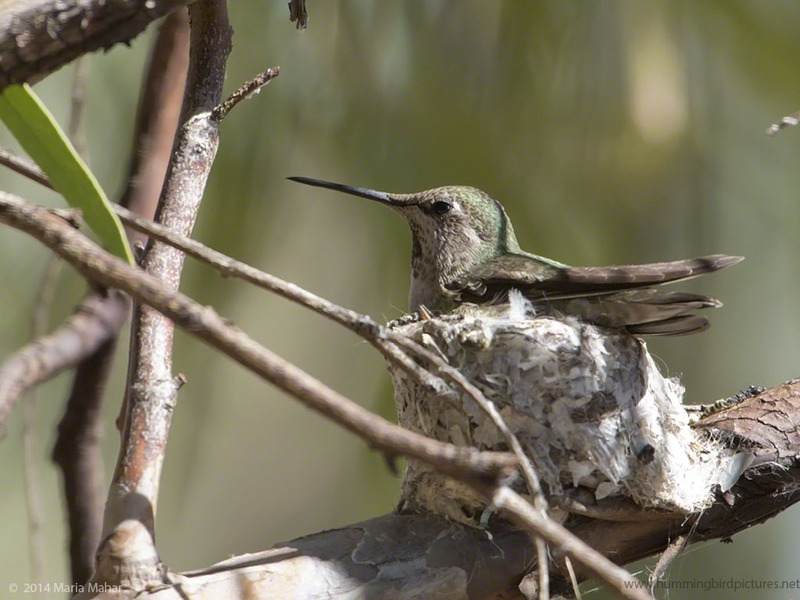 Here’s a Mother’s Day hummingbird, tending her big chicks today, May 11, 2014. It’s Mother’s Day today here in the U.S. and in many parts of the world. We think this hummingbird mom is the same Anna’s Hummingbird who already successfully raised a brood of chicks this season. But there is no way to really know. The hummingbird babies in this nest are about to fledge. One of them was practicing wing flapping this morning. 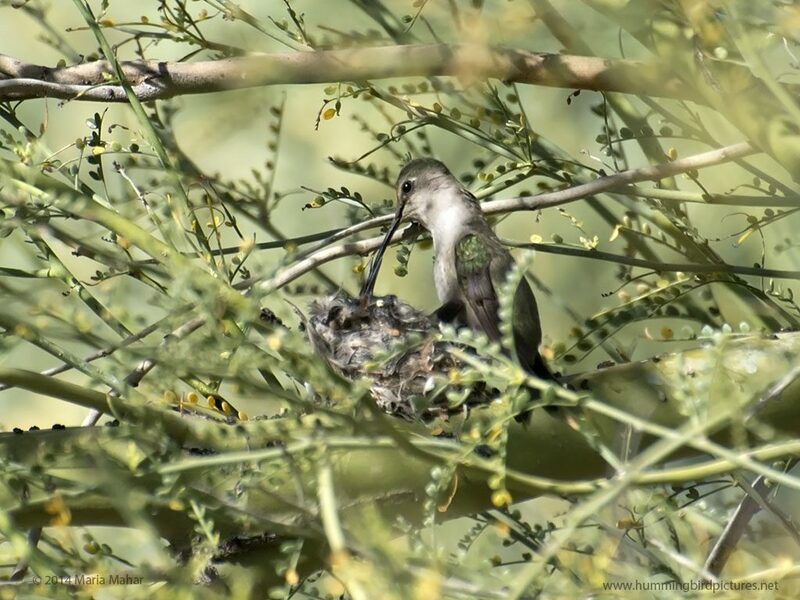 There are many other hummingbird mom pictures in these recent posts: Desert Botanical Garden nests, a nest in the Aviary at Arizona Sonora Desert Museum, and a mother feeding a fledgling. Older posts: a mother feeding young babies, and a mother sitting the nest. Happy Mother’s Day to all moms and their families! 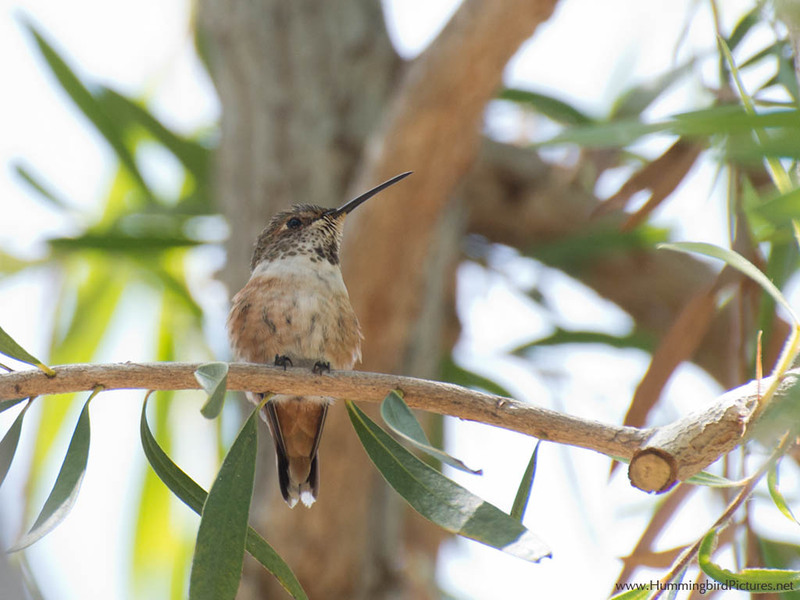 Each spring, we keep an eye out for hummingbird nests at the Desert Botanical Garden. 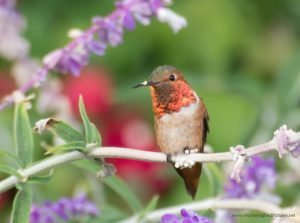 The Garden has created a haven for our local hummingbirds, with its variety of plants, cover, and the availability of water. It is a perfect place for hummingbirds to nest. Here are some nests from spring 2014. This Anna’s Hummingbird put her nest directly over a busy walking path near the center of the Garden. Many Garden visitors were lucky enough to notice the nest overhead and paused briefly to watch. Here are a series of pictures taken over several weeks. Note: The photos in this post were taken with a super telephoto lens (500mm). Here the mother perched on an agave leaf, watching. She was often visible hunting for insects or feeding from flowers. Or she could be seen perching nearby, watching the nest and the general area. 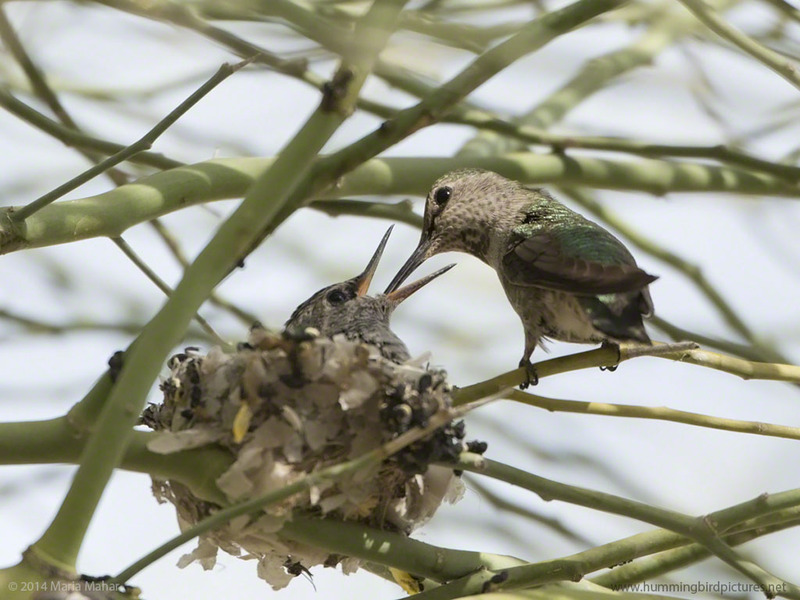 Amidst the tangled twigs of a Palo Verde tree, the mother sat on the edge of the nest with one of the baby hummingbirds visible. Hummingbirds typically lay two eggs. The two chicks (or babies) often hatch a day or so apart. The first chick may leave the nest a day or more before the second one does. In this photo, the mother feeds her last baby in the nest. It was practicing flapping its wings on this day and looked ready to leave. Her other chick – now a fledgling – was up in the branches above the nest. The fledglings are not immediately on their own once they leave the nest. 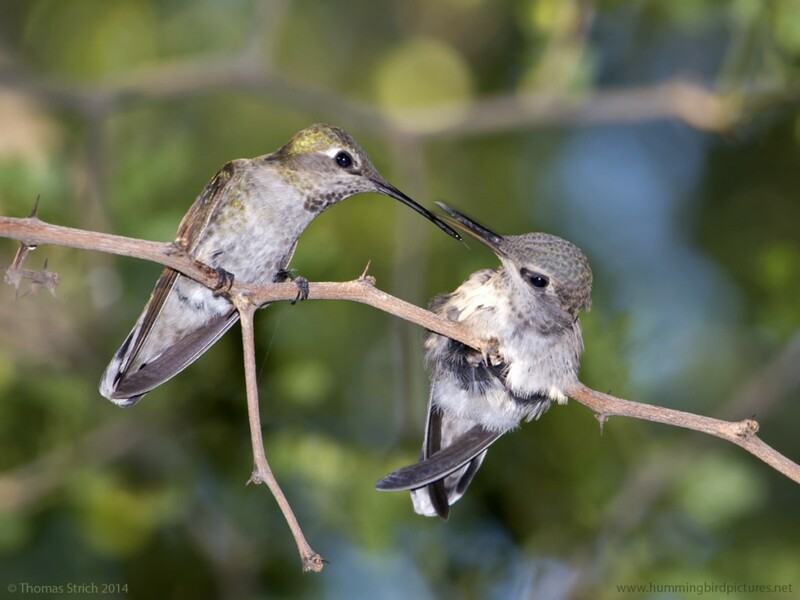 A mother Anna’s Hummingbird will come back to feed her fledglings for some period of time. The mother came and fed this fledgling around the same time she fed the chick still in the nest. The next time I came through, the nest was empty. 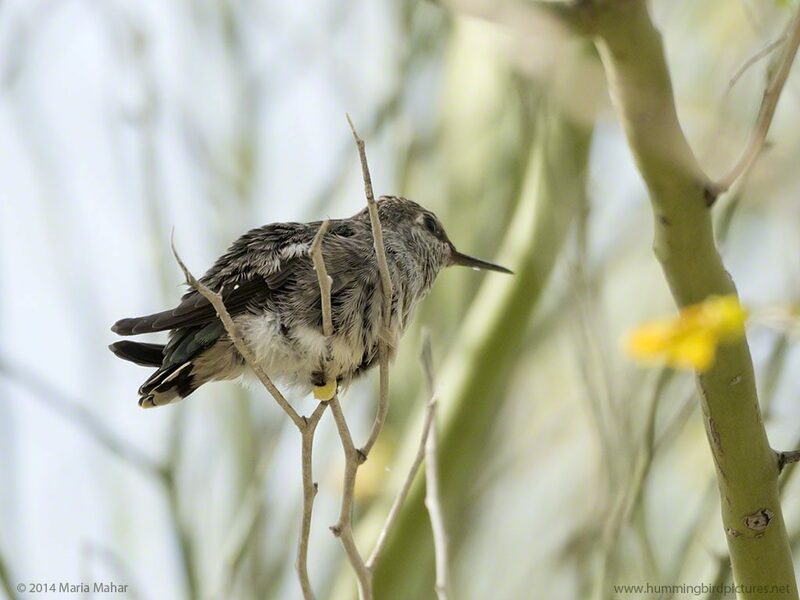 We saw a couple of other hummingbird nests at the Desert Botanical Garden that spring. We heard of even more. Hummingbird nests are usually hard to see for many reasons: tiny size, location, foliage. 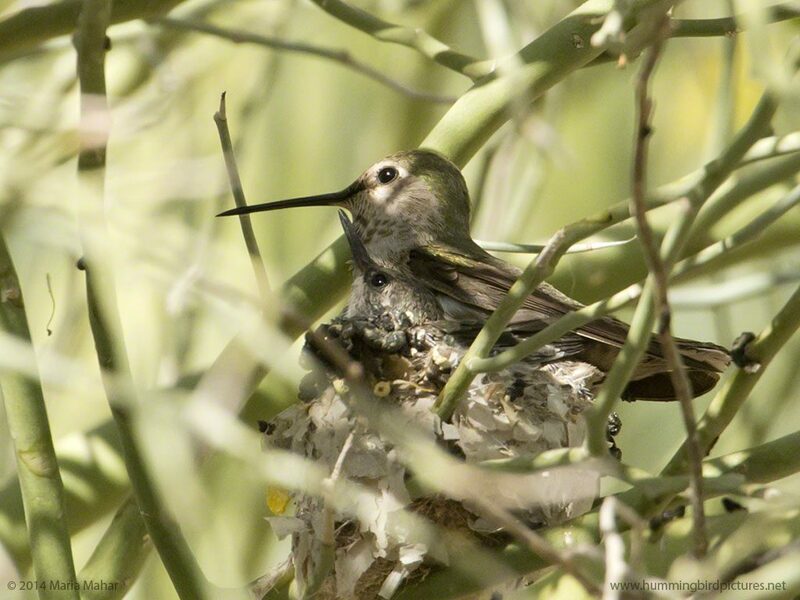 Here are pictures of two other hummingbird nests at the Desert Botanical Garden, just for fun. 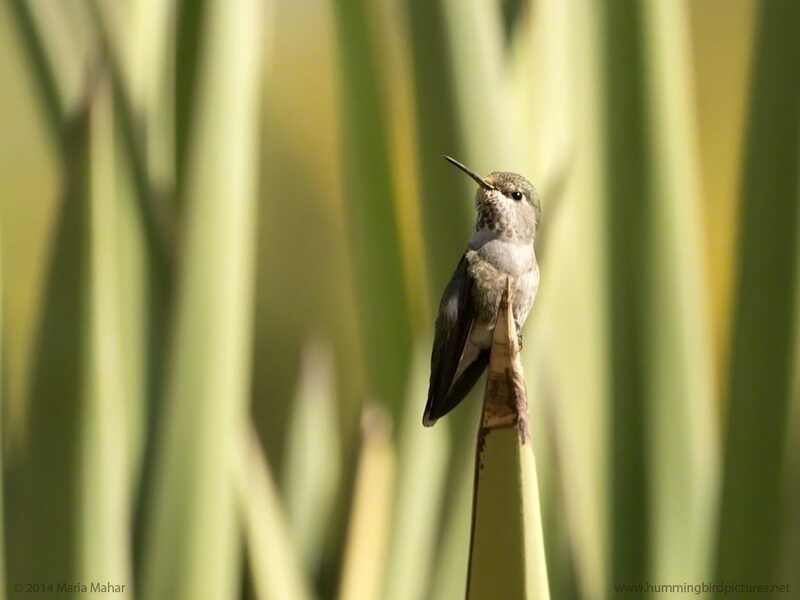 Though not a native tree, hummingbirds make good use of Eucalyptus. 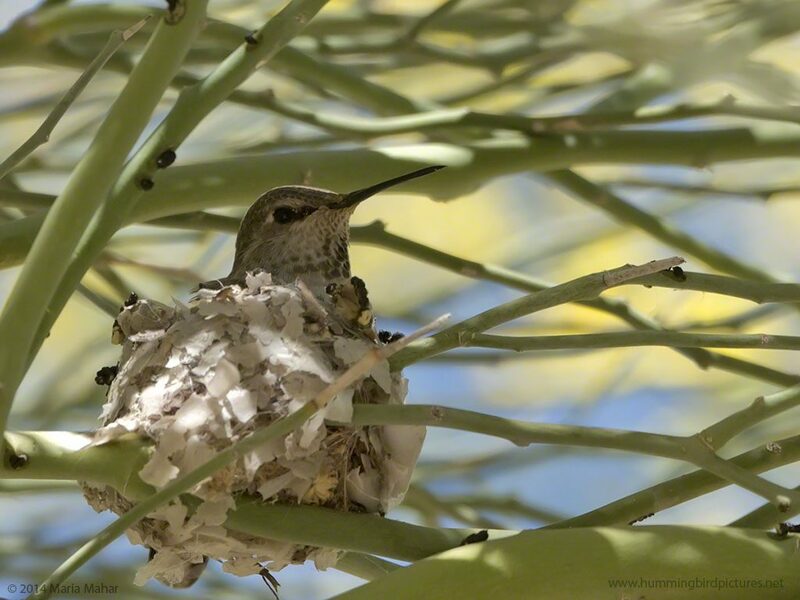 The tangled twigs of the Palo Verde tree make a good, small enclosure for a hummingbird nest. Special thanks to the Garden staff and volunteers for watching out for the hummingbird families while still allowing us to share in the wonder. Back to home or hummingbird picture posts or nesting posts. 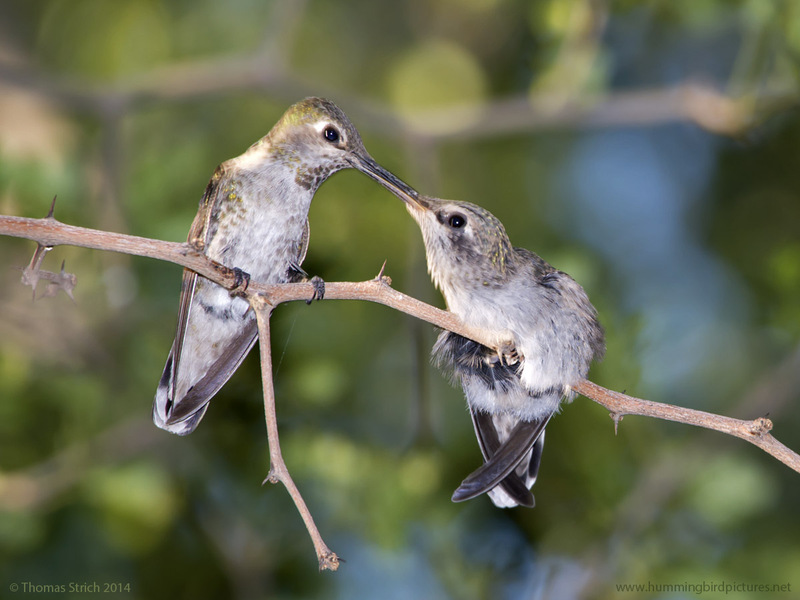 Here’s a close look at a mother Anna’s Hummingbird feeding her fledgling hummingbird. All week long, we heard “peep, peep” from one, sometimes two, young Anna’s Hummingbirds in the Texas Ebony trees outside our front door. 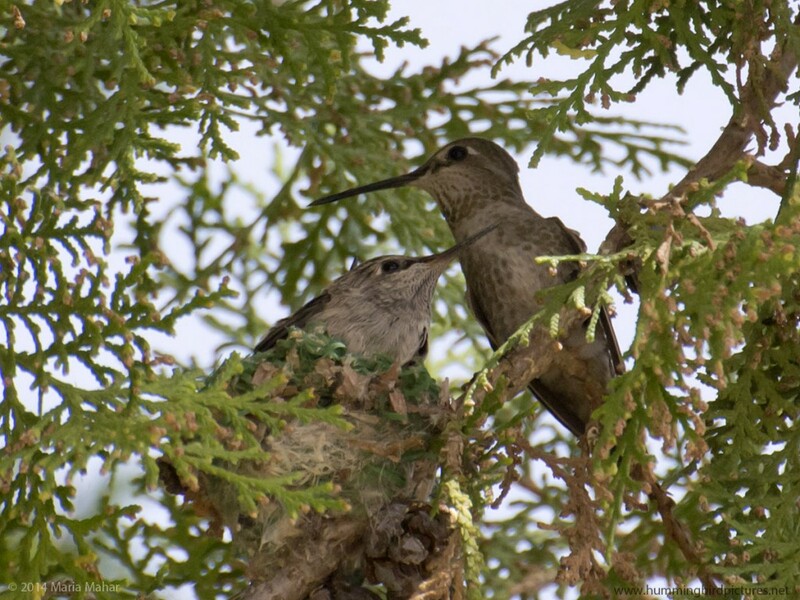 These baby hummingbirds left (“fledged”) their nearby nest at the end of March/early April 2014. One of the fledglings in particular stayed in the trees and waited to be fed. It would flit around in the branches a little. It also did a lot of perching and waiting. And calling. Every so often, we could hear the “chip! chip!” of the mother Anna’s Hummingbird as she announced her approach to her young hummingbirds. She would often vocalize briefly, then perch beside one of her fledglings, look around, then feed it. She was in and out. The hummingbirds are about the size of the curved, dark brown seed pods that are scattered throughout the Texas Ebony tree branches. It was difficult to see the perched birds in the shady canopy and against the bright sky. It was easier to hear them or wait for them to fly about in the branches. The mother was frequently at the feeder or hummingbird flowers before and after she flew into the branches to feed her young. Go here to see this hummingbird family while the babies were still in the nest. 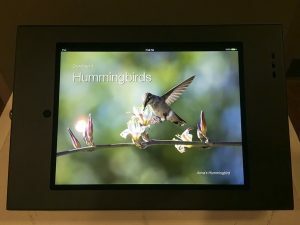 Back to home or hummingbird pictures posts or nesting posts.